Bathrooms are a combination of updates to existing baths, additions with newly created bath space, and bathrooms from newly found space. The possibilities are endless, and each one is unique to its owner’s styles and needs. Accessibility for physical challenges is always considered, with grab bars a practical integration. 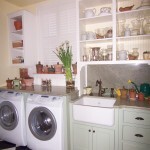 With some planning, laundry rooms have dual functions. Side by side washer dryer combos provide surface for potting areas, bar surfaces, and more. 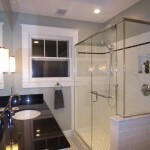 Space for enlarging this small bath came from opening into an oversized bedroom. 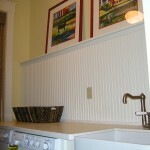 The radiator is hidden between the vanity bowls in custom cabinets. 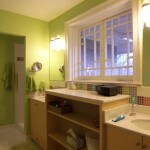 Colorful glass tile enlivens this room. 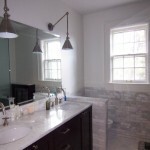 Cararra marble tile walls and shower floor, with 1″ glass tiles in the shower area, vanity lamps on reticulating arms, and diagonal carrara floor tiles give this master bath area a mix of old an new that is stunning. 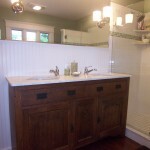 Using an antique oak dresser converted to a vanity with a carrara surface maintained the old house character, while all else in this remodel was completely new. The shower has a rain head, and a hand held with a corner bench. Windows were replaced providing additional lighting and ventilation. 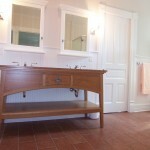 A custom built Shaker style vanity sets the tone for a unique mix of history in this early 1900’s home. 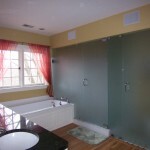 Plumbing failure, as is often the case, prompted this bathroom remodel. 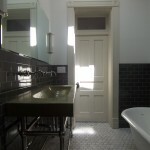 Black and white tile in addition to trim detail captures the history of the home. 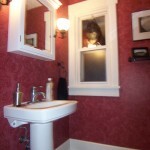 Smart ideas and custom updates really brightened up this Highland’s bathroom. 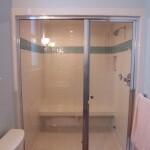 The tub was removed, and a glass-enclosed shower was installed. 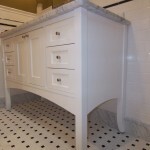 The vanity cabinet is custom with drawer sizes specified by owner topped with granite. The white octagonal tile maintains the “old house” look. A skylight adds dramatic lighting. Entry to the yard from this room allow it to function as a mud room, and potting area in addition to the laundry room. For a large family gathering or a party, you will be directed to this area for beverages. Attic spaces are always so unique. A skylight adds the feeling of head room in this sloped ceiling.